I was surfing my way through the blogoshere a few days ago and came across an anti-Urban Outfitters tirade. I wish I could remember the author, so that I could send you a link, because this was a very hot topic! Commenters came down with passion on both sides of the argument, stating Urban was a great place for those with a funky taste and a low budget on the one side. The original post, and second camp of commenters, had a distaste for Urban as a hallowed ground for wannabe hipsters. Personally, I've never found much in the way of clothing at Urban that tickled my fancy, but I LOVE their funky accessories, home furnishings and books. On my way home yesterday I popped into Urban to see what was new and found a lot to love. First, they have started carrying a large chunk of the knock knock stationary line. I've been a knock knock fan for years! 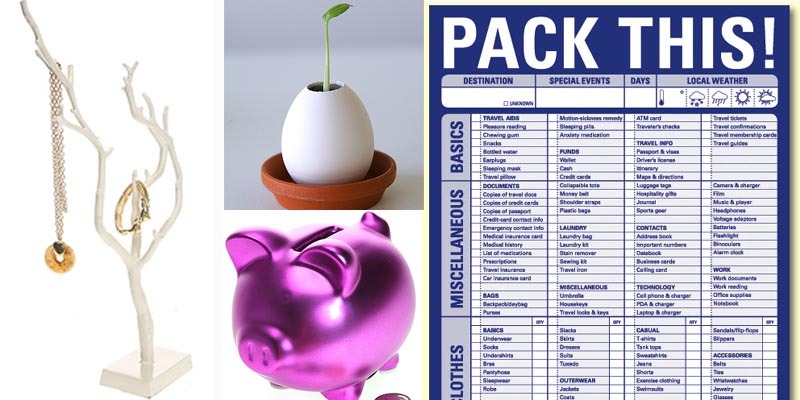 They make the most hilarious, creative and sometimes immensely useful products, like the extensive packing checklist pictured above. Anything that helps knock knock stay in business and succeed is fabulous in my book. Urban has continued to carry "egglings," a product that I am convinced must have started in Japan, which was a bit of a fad amongst my friends and coworkers. Egglings are perfectly enclosed ceramic eggs containing soil, which one cracks open with a spoon, deposits seeds in and waits for a baby plant to sprout. I grew the most amazing petunia at work, which took over my entire windowsill, died and then left a whole bunch of seedlings behind which have been popping up in other plant's pots for about a year now. I was totally in love with the hot pink frosted piggy bank which I spotted almost as soon as I walked into Urban. It is perfect, a little bit retro, a little bit kitsch and so very very pink!! It would make the perfect replacement for the giant plastic pez dispenser piggy bank that I've had since high school and have needed to replace for several years now. Finally Urban has a whole array of jewelry display and storage knick knacks. My favorite is the pictured branch, which I fell in love with in the store in a bronze finish (which is actually not available online). I'm not sure if I would use it for necklaces I wear, necklaces I'm currently making (I design jewelry as a hobby) or perhaps even my little collection of miniature funky blown glass ornaments from department 56. It is a very cute piece~it will look very nice with your jewelry! What color are you thinking? I don't know? I thought I might take a look at the display in person (I've only looked online so far...) Maybe I'll swing by UO on my way home tonight!